Unlike so many fusty, windowless hotel dining rooms we’ve become so accustomed to, Radisson Blu Edwardian’s ‘Kitchen’ restaurants (other than the Michelin feted fine dining temples) are a rare breed that you might actually fancy visiting for dinner, even if you’re not conveniently staying upstairs. 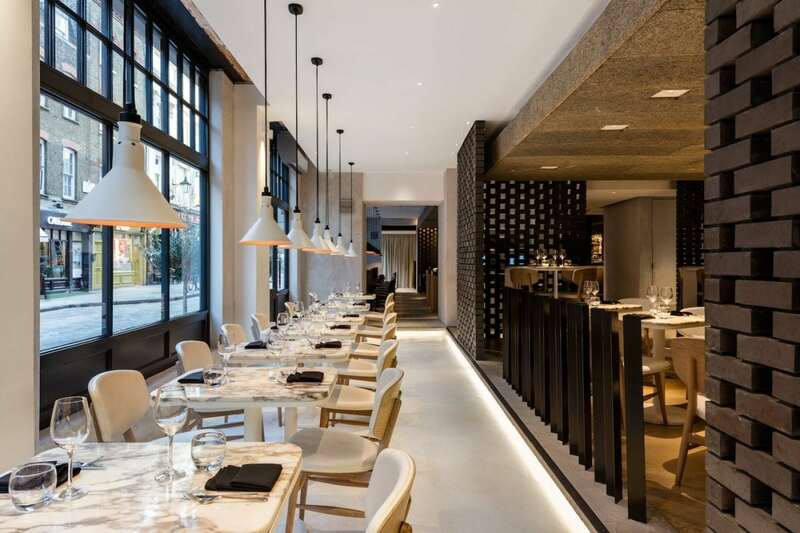 Part of the group’s Covent Garden hotel, Monmouth Kitchen opened last year, following the success of May Fair Kitchen (sic), followed by Leicester Square Kitchen earlier this year. With its own separate entrance on Monmouth Street, Monmouth Kitchen is a long, narrow space lined with large windows that peer onto the cobbles of Seven Dials. An example of modernist minimalism, the dining room is white washed and festooned with slate brickwork, light wood dining chairs and marble table tops. As is the case at the other restaurants, the menu at Monmouth Kitchen is split into two distinctively dissimilar sections. Here, a selection of both Italian and ‘Contemporary Peruvian’. Frightening as the concoction may seem, each section has its own identity, completely bereft of any cack-handed fusion dishes – thank goodness. Our waiter capably recommends a number of dishes (all of which are designed to be shared), with particular emphasis on the Peruvian half of the menu. We trust his judgement and dishes quickly begin to arrive. From the Italian section, beef carpaccio prizes thin slices of fillet steak, nominally seared then dressed with parmesan shavings and dressed rocket. The dish is fine, but somewhat forgettable. Chicken and spinach risotto, on the other hand, harbours rice that’s overcooked to the point of becoming unpleasantly lax, almost slimy. The zing of lemon zest is welcome, as is the generous heap of parmesan added at the table, but the entire dish has a texture similar to rice pudding. It’s soon clear that Monmouth Kitchen’s Peruvian menu is far superior. Crispy corn tacos are served in pairs and literally bite-sized. Filled with various crowd-pleasing flavour combinations, the tacos are some one of the best things eaten at Monmouth Kitchen. 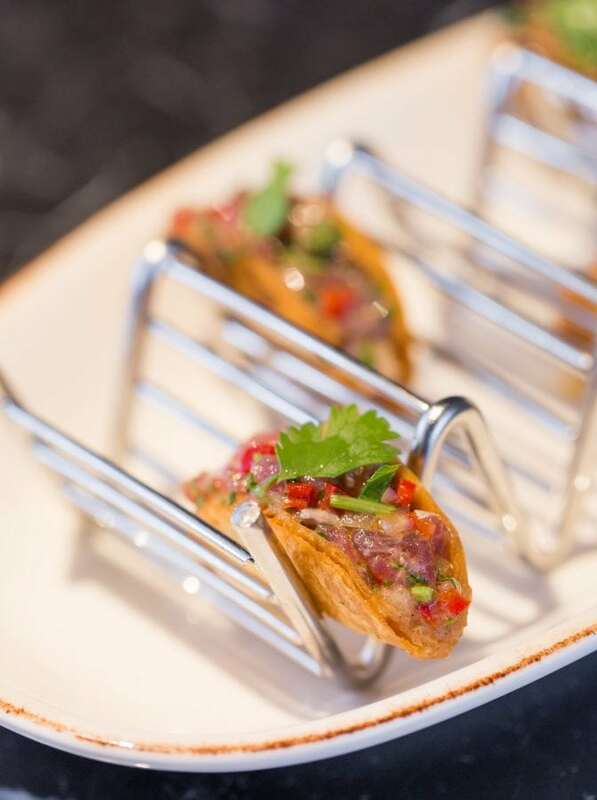 Raw tuna dice, for instance, are teamed with finely chopped red onion, fresh chilli, coriander and a squeeze of lemon juice, delightful with the taco shell and its texturally contrasting crunch. We’re advised to order one each, but would happily devour far more. Sea bass ceviche is embellished with the chomp of sweetcorn, creamy avocado and a torrent of red onion. A fair clout of citrus permeates the ceviche’s tiger’s milk, though the sea bass is sliced a little too thick, discordant with the dish’s elegance. Far more lavish is the lobster ceviche, although cooked, finished with a pool of sauce rife with citrus, paper thin radish, red onion and Heritage tomatoes. Three lamb cutlets are well-prepared and served on a hot lava stone, partially cooked. We’re instructed on cooking times for varying levels of “done-ness” and left to enjoy. Personally, I enjoy lamb cooked rarer than beef – providing the fat is properly rendered. The cutlets are delightful, though it’s the heavy Anticucho marinade, acting as sauce, that’s most resplendently invigorating. Made with cumin, garlic, vinegar and plenty of ají panca – a fruity, sweet, smoky chilli – it’s the sort of sauce that makes the world seem a far better place. 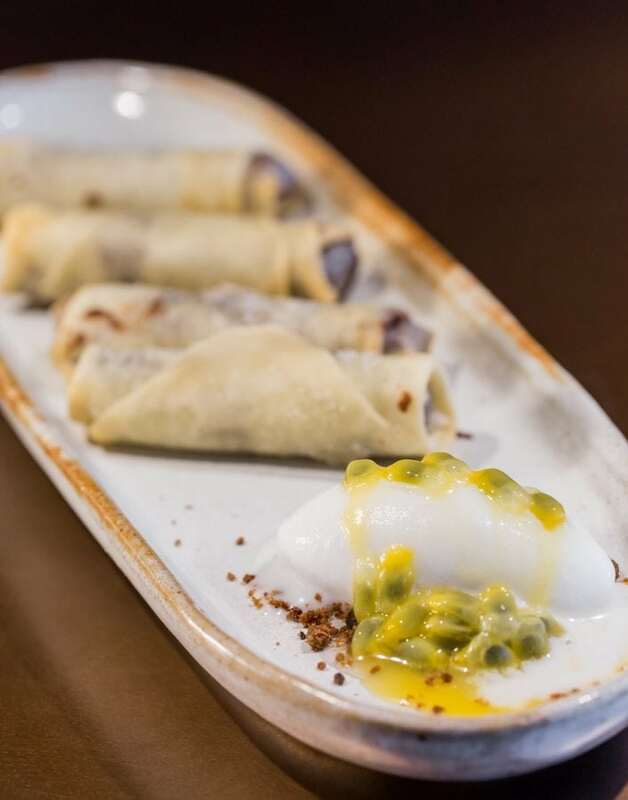 We finish with chocolate Caliente – a dessert comprised of ‘spring rolls’ filled with chocolate and deep-fried (sweet, but not tooth-achingly so), with fresh passion fruit and coconut sorbet to cut through the richness. While the dual cuisine concept has a weak link – the Peruvian side of the menu at Monmouth Kitchen is worth experiencing. Just don’t forget to order the Anticucho lamb cutlets and plenty of tacos. Monmouth Kitchen can be found at Radisson Blue Edwardian Covent Garden, 20 Mercer Street (restaurant entrance on Monmouth Street), London, WC2H 9HD.